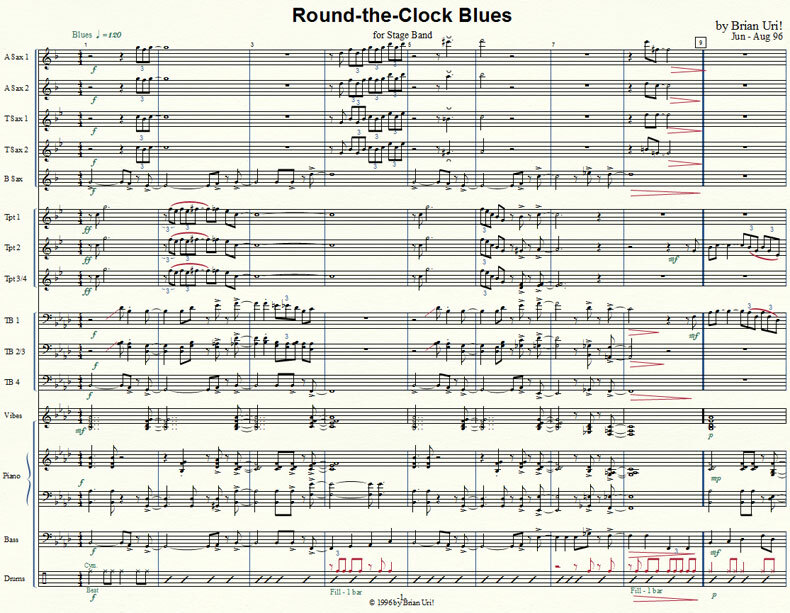 Round-the-Clock Blues was my last composition from the high school era, before I went off to college for formal training to write seriously serious music with themes and other garbage. I got the title from a dictionary of cliches, which is common for most blues charts but which doesn't reach the creative heights of Stan Kenton's Blues in Asia Minor. This was the longest composition to date, clocking in over six minutes in length and taking two and a half months to write. As previously mentioned, I learned jazz harmonies by requesting sample tapes and scores from sellers of jazz sheet music. Kendor Jazz was especially bountiful in this regards, often providing complete miniature scores for twenty songs per year. From the sound of this chart, I was still awed that you could stick a major 9th into a minor 7th chord and not impact its character. This chart also contains my first attempt at a contrapuntal ensemble section (3:59 - 4:49), inspired by similar sections from arrangements by the Tonight Show Band. I was a fairly weak improviser in high school. For the two solo sections in the realized MIDI, I recorded myself improvising over the changes over many, many takes, and then cherry-picked the least offensive lines to transcribe. After this piece, it would be another three years before I returned to a pure jazz chart, because budding composers aren't supposed to write music with consonant harmonies. 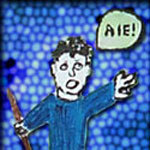 Next Post: Diablo 3 PSA: Turning on "Elective Mode"